On her first visit to Butaro Hospital to train Rwandan doctors in cancer care, the dorm-style housing where Dr. Susan Troyan stayed was at full capacity, and the one shower room was constantly in demand. The new doctors’ quarters On her first visit to Butaro Hospital to train Rwandan doctors in cancer care, the dorm-style housing where Susan Troyan, MD, stayed was at full capacity, and the one shower room was constantly in demand. Now the new doctors’ quarters provide physicians like Troyan with the privacy they need to unwind and refuel, and focus on the mission at hand. Not only does the housing provide comfortable accommodations, it also has earned international acclaim from a prestigious competition sponsored by World Architecture News. In October, the Butaro Doctors’ Housing project was named one of six finalists for the Buro Happold Architectural Effectiveness Award, which was judged on originality, innovation, form, special quality, sustainability, and most importantly, positive impact on society. In early November, the physicians’ housing project captured first prize. The housing has made a profound impact on the local economy. The project employed 900 Rwandans and provided training in seismic construction, masonry, carpentry, and terracing practices—useful skills for future employment. To learn more about this award, see Ponton’s African housing project wins architecture award. In much of the developing world, people lack access to basic medical care that we take for granted. Access to specialized treatment such as neurosurgery is almost non-existent. With a population of more than 40 million people, the East African country of Tanzania is home to only three neurosurgeons. 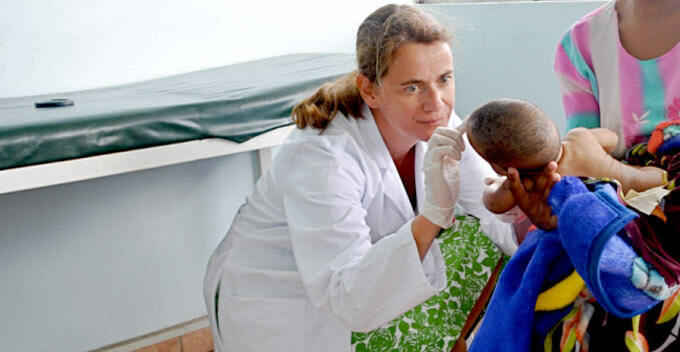 Support from the Daniel E. Ponton Fund has enabled Alexandra Golby, MD, and a team of BWH neurosurgeons in 2009 to teach neurosurgical techniques to Tanzanian clinicians. This year, Golby’s team included a physical therapist and pediatric and adult nurses. On a recent trip, the team trained Tanzanian clinicians in life-saving procedures to combat hydrocephalus, head trauma, spine disease, and other ailments. The team also established a sustainable education program to help local medical personnel to continue to provide treatment after the BWH staff departs. While hip and knee joint replacements are common procedures in the United States, they remain out of reach for much of the developing world, confining people to limited mobility and pain and often resulting in loss of livelihood. Operation Walk provides hip and knee replacements to patients in the Dominican Republic (DR) who otherwise would not have access. The Ponton Fund has helped support Operation Walk’s efforts, specifically providing care and supplies and transporting teams of medical volunteers to care for patients. A remarkable aspect of Operation Walk Boston is that it goes further than direct, quick impact. The program serves as a training ground for local healthcare providers in the DR from experienced and new surgeons to nurses, therapists, and medical students. These professionals are trained in advanced medical procedures and post-operative rehabilitation and care. Since 2007, BWH staff members have performed more than 250 hip and knee joint replacement surgeries in the DR.